I know there have been some reviews done of this watch. But now I have been living with mine for a while I thought I'd give my impressions. As some may already know it was named after the depth rating of the earlier models - but is a misnomer as it has a wrt of 300m/1000ft rather than the 91m equivalent of 50 fathoms. (A fathom being 6ft in depth). I think it was made famous by the diver Jacque Cousteau when he wore it in his dives. It is an impressive watch with very easy to read dial and the sapphire covered bezel with all luminous markers is the trademark of this watch. Not small measuring 45mm diameter - and with that wide bezel it is no wall-flower. The domed sapphire crystal and equally domed sapphire over the bezel makes it superb to gaze at. The sword hands are lumed and applied lumed markers and even the second hand - with it's catch of red tip, is lumed. So if you ever walk into a dark room from being sunlit outside - the whole face lights up with the bezel markers and marker Arabic numbers. The crown is super smooth with large knurled finish makes it easy to turn and with a screw down crown with assuring gasket visible and crown guards - shows it's dive pedigree. The bracelet is superbly built with butterfly deployant strongly sprung and with an additional folder over - makes for an integrated look and feel - there is no bulky pieces sticking out to be marked on desks. This bracelet is the reverse of some - being brushed centre links and polished outer. It does not have any micro adjustment though it does have 1/2links - this is a bit of a pain (to say the least) but now the super hot weather is over I have it set so it is comfortable. I had it on the provided sail-cloth strap - after buying the 0.9mm alan-keys off eBay for peanuts needed to change the strap / bracelet. The case is highly polished with no hard edges - with the case profile matching the profile of the bezel e.g. rounded. It fits like a glove to my wrist and with the lugs having a downward profile it means this large watch fits ok on my 6 and 3/4 wrist (with a fairly flat wrist). Value for money: Difficult to say - it is an expensive watch but can be picked up second hand at reasonable prices - some have sold here at way under market value (IMHO). 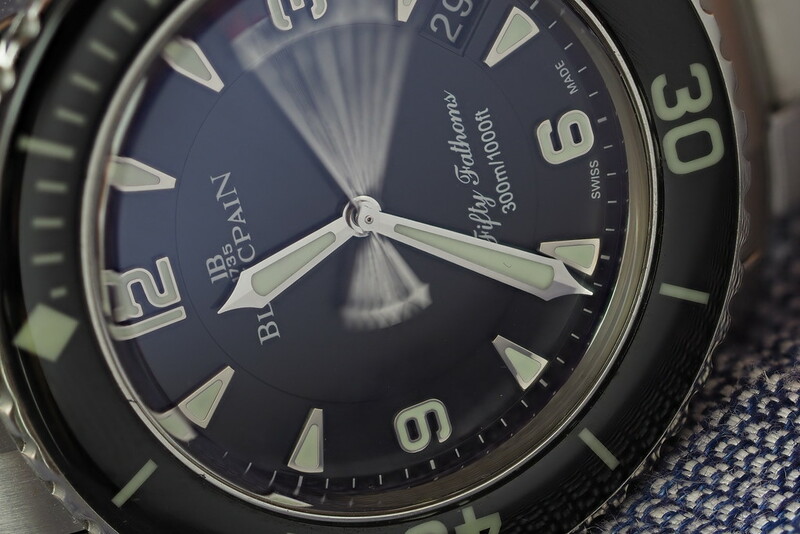 There is a 38mm LE version from Basel this year - which may suit, hopefully Blancpain may bring out a smaller unlimited edition if the LE is a success - which it seems to be. Also comes in blue and now in Ti case so would be lighter. Will I sell: Don't ask any forum member that and expect a straight answer! Last edited by MartynJC (UK); 28th January 2018 at 00:36. 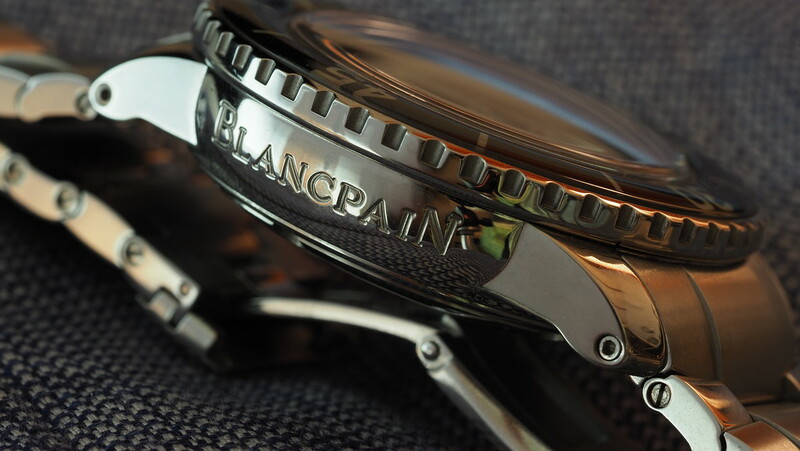 Blancpain is too often overlooked in favour of the usual suspects and more should try them. Their quality is absolutely amazing but there seems to be a resistance to try something off the beaten path which may explain the low forum sales. All the photos are the same??? Good, fair, review. I tried one in Burrells, Winchester, and thought it a handsome watch. But, for my current tastes, too big. 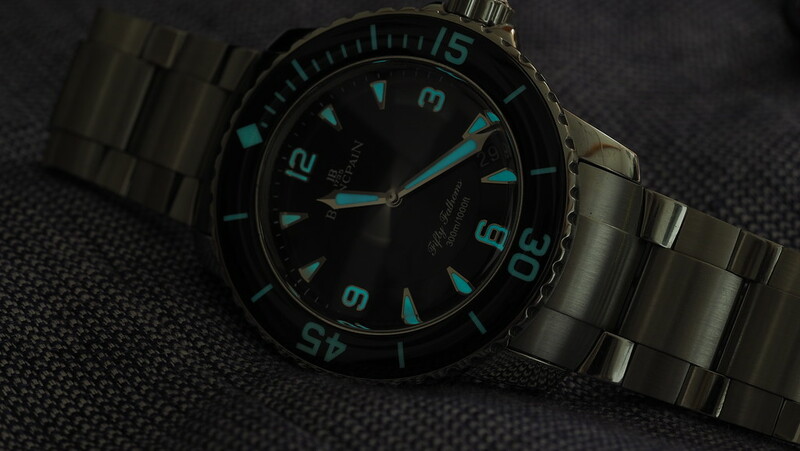 Their obvious problem is the arrival of the 43mm Seadweller, notionally cheaper and with much stronger residuals. I wonder if Blancpain have shot themselves in the foot by becoming essentially a 'dive watch' company, with the rest of their ranges residing in semi-obscurity? Gorgeous watch - Not a grail, as such, but a watch I'd own if I was prepared to spend that much on one watch. I guess some people would cross shop Rolex against Blancpain, but I suspect most people choose it because it's NOT a Rolex (dare I say it, the 'obvious' choice). Personally, I don't see any great appeal in the SD, but if I had the inclination to spend this kind of money on a watch, it'd be a Fifty Fathoms. 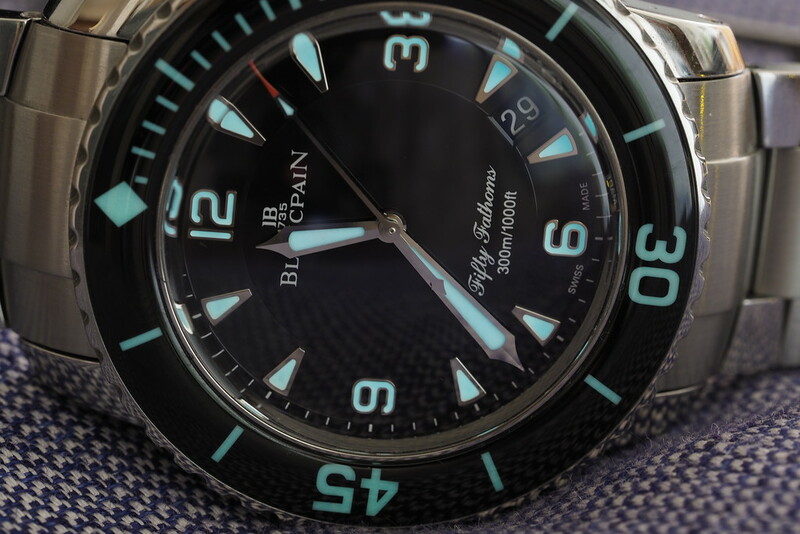 PS Paskinner - I'm not sure Blancpain made that decision, the rest of the world did! Last edited by snowman; 31st January 2018 at 11:53. The same for me. Much rarer than the SeaDweller and more history. 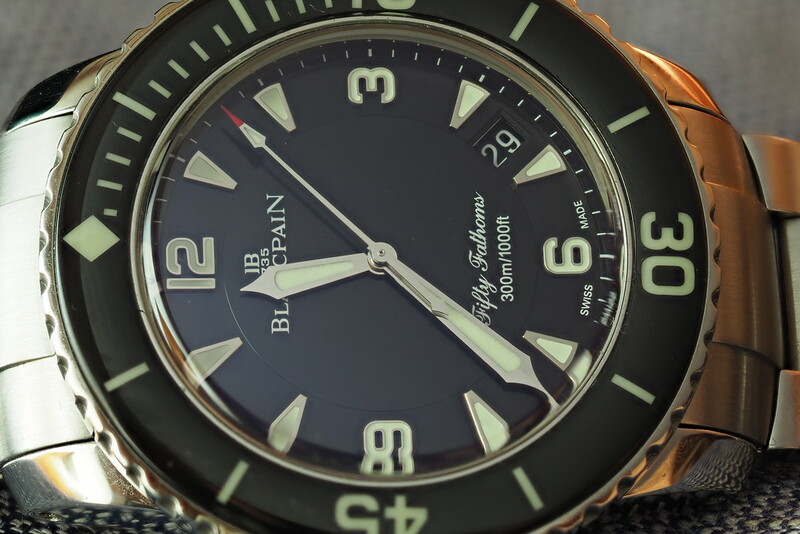 This is going to be my next diver as I've finally made up my mind to sell my D serial Subby. I was only introduced to blacpain a year ago, and I must say, it has grown massively on me. This is just gorgeous. 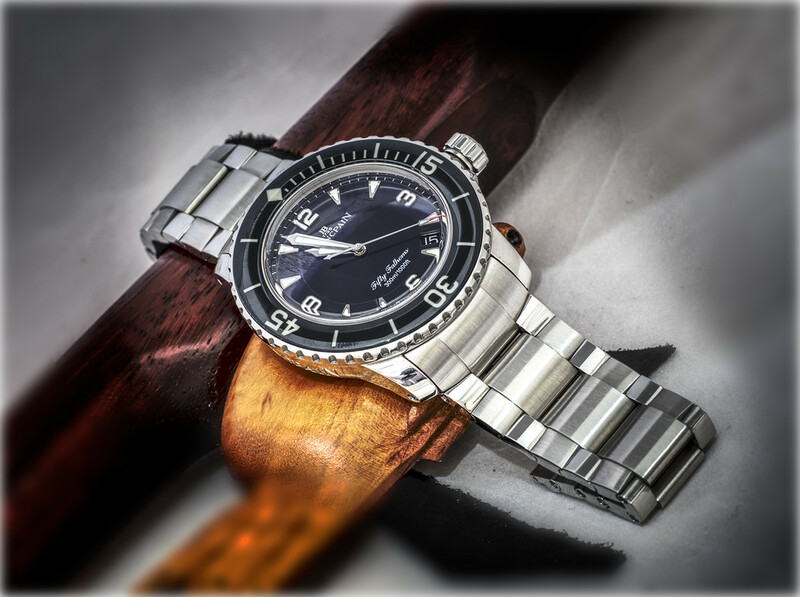 Nice review and even nicer pics of one of the greatest modern dive watches out there. Congratulations on this great time piece. 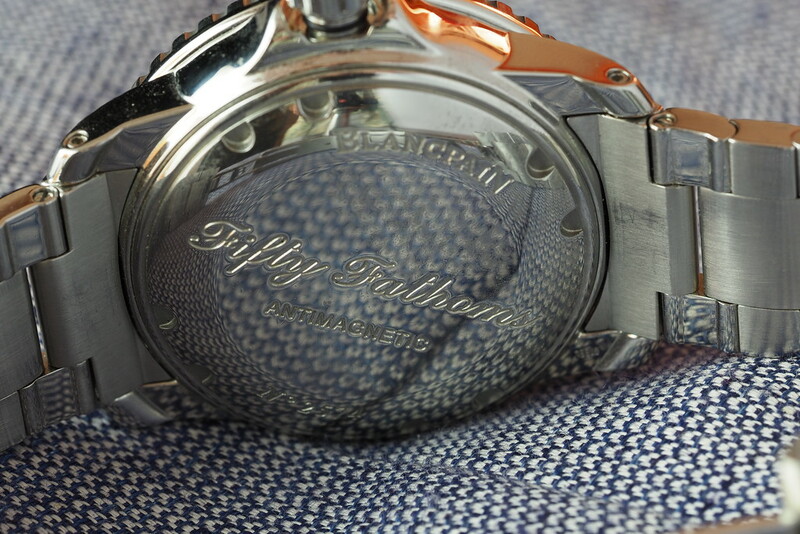 It is truly a gorgeous watch - I prefer on the sailcloth strap, but still nice on bracelet. The italic script really adds to the face. Last edited by andy tims; 16th March 2018 at 11:27. Only just seen this - thank you for the review! Never like to miss an opportunity to hear an owner's thoughts on my grail watch. Beautiful photos too. I too have only just seen this. Nice read - thank you. Lovely watch and an excellent review. Thanks for posting. I'd have one of these over a Rolex any day. Wonderful, it's a dream watch, unfortunately a little (€$) off my league. Great review and nicely done photos.